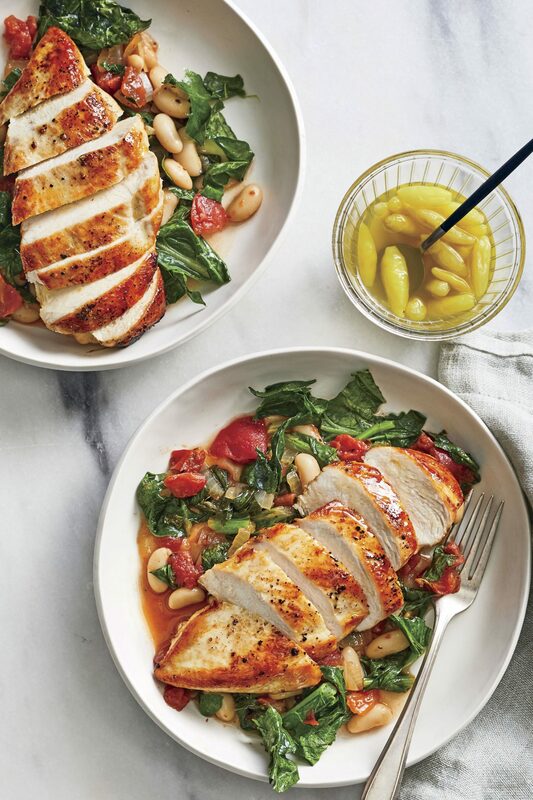 So long, more expensive, bigger-than-they-should-be chicken breasts! Thighs are a naturally flavorful, less expensive, and perfectly portioned cut of chicken that are great for busy weeknights or for serving dinner to company—depending on the recipe and side dishes you choose. Anchovy paste lends depth without tasting fishy. These Carolina-style barbecue chicken thighs are smothered with a tangy-sweet sauce that will please the whole family. The tasty Asian-inspired glaze gives these chicken thighs a mahogany sheen. Rich thigh meat is higher in fat than lean white meat, so the thighs stay moist even when they're roasted without skin. The skin is a treat. There are four steps to making it crispy. When it's finished on the stove, you'll pop the skillet into the oven where it finishes the crisping process. This vibrant chicken dish gets a sweetened upgrade from a honey and apricot glaze. This crispy chicken can be on your table in less than 30 minutes! Pro tip: flip the thighs during the last few minutes in the oven. Hot air will wash over the skins, crisping them to perfection. This spicy chicken dish is popular with online reviewers as a satisfying last-minute meal on busy weeknights. Serve over quick-cooking brown rice and with a steamed green veggie. The combination of ingredients such as chili powder, ground ginger, barbecue sauce, apricot preserves and lime juice creates a perfect sweet-and-savory flavor for these baked chicken thighs. You can roast the chicken skin till it's crisp, rendering out much of the fat and capturing lots of chickeny goodness for a wintry braised main dish. Start checking the skins after 30 minutes in 5-minute intervals; they can quickly go from perfectly crisp to burned. One of the most popular Cooking Light chicken recipes, these sweet and spicy grilled chicken thighs are flavored with chili powder, cumin, garlic and cider vinegar. 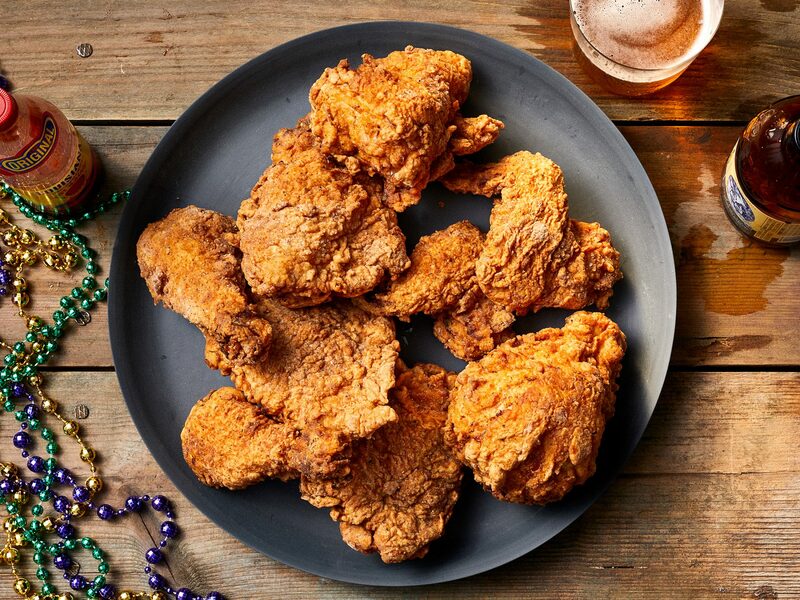 Crispy, crunchy chicken drizzled with a spicy honey mustard sauce is soon to become a favorite chicken dish. Baking the chicken provides a satisfying crunch without the added fat from frying. 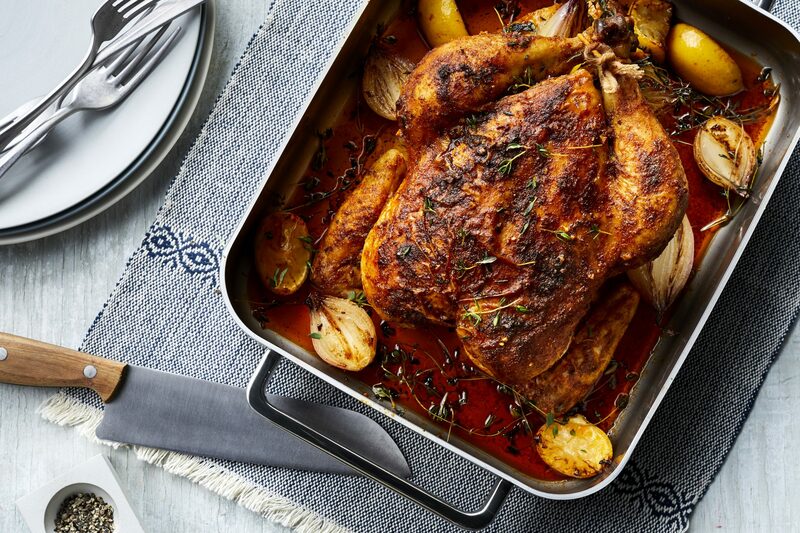 Aromatic rosemary and thyme transport your tastebuds straight to the hills of Provence, France in this succulent, one-pan chicken recipe. To shorten cooking time, cook chicken and vegetables at the same time in separate pans. Remove vegetables after 30 minutes and keep warm. Cook the chicken five minutes longer and serve. 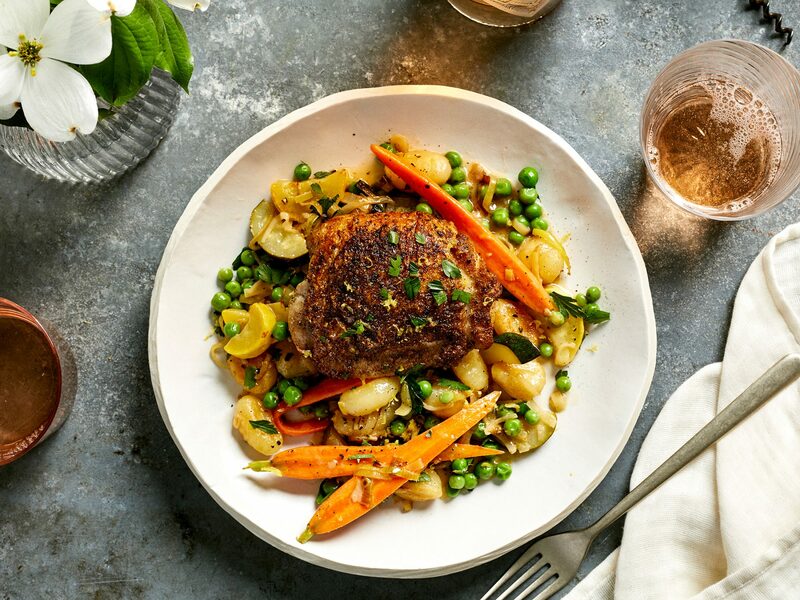 This bright and earthy braise, adapted from Paula Wolfert's The Food of Morocco (Ecco, 2011; $45), is a regular on the cafe menu at Chez Panisse, in Berkeley. The restaurant cures its lemons the traditional way; for our shortcut, see "Speedy Preserved Meyer Lemons." Figs get a nice jammy texture as they cook with chicken in the garlic-honey sauce. For crisp chicken skin, resist the urge to spoon sauce over it during baking. Braising gives you tender, tasty results and a pan sauce to boot. Online reviewers offer this easy cleanup tip: line your broiler pan with foil to keep the sugary sauce from sticking to the pan.